We took our two Alabama grandsons to nearby Wheeler National Wildlife Refuge November 25, 2018. 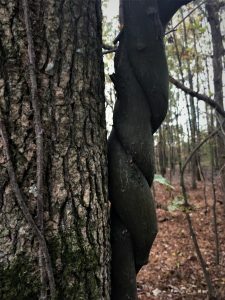 I snapped the first three images below from our hike (Post issued December 11, 2018: http://stevejonesgbh.com/2018/12/11/late-november-at-wheeler-national-wildlife-refuge-tree-magic/). 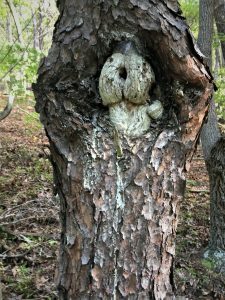 For this mid-January GBH Blog Post I have compiled these three with other photos of unusual tree shapes and forms I’ve photographed over this past summer and fall. 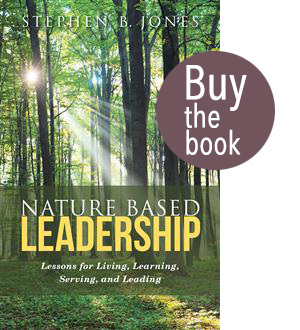 I’ve said often that every lesson for living, learning, serving, and leading is either written indelibly in Nature or is compellingly inspired by Nature. I took a lot of photos November 25 when something caught my eye, including the one below. A hackberry trail-side evidenced a small burl at me eye level. A cluster of branchlets sprouted from it horizontally, crossing to an adjacent smaller fork of the same tree. The view may span eight inches. The peculiar composite struck me with force only after I examined the photo at home. Sure, I saw something in it that drew me to snap the photo, yet not enough so that I took more photos from different angles and distances from the tree. I believe I can find this odd assemblage the next time I visit Wheeler. Well, my older grandson and I invested an hour weeks later, searching exhaustively where I knew I could find the oddity. It eluded us! Lesson learned — next time take more photos on the spot. Upon closer inspection and pondering, here is what caught my attention. How on earth did this mass occur? 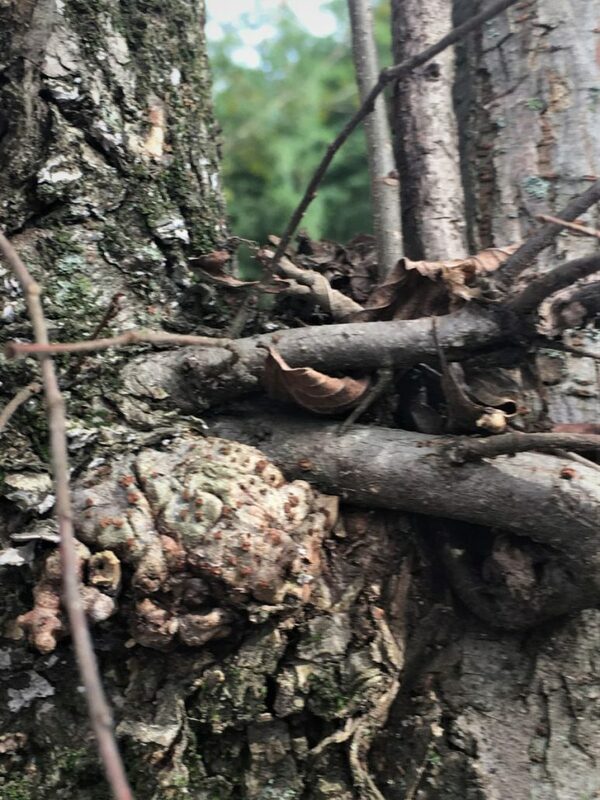 A viral-precipitated burl perhaps — a tree version of a tumor? 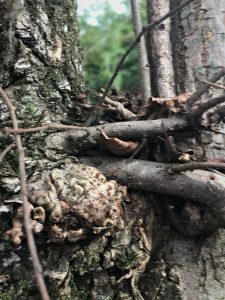 The tumor’s growth, combined with the pressure of the twin stems forging together triggered epicormic branches to develop, creating in sum this strange mass of tissue and side stems? A real mess that I stumbled upon at a point in time well beyond the initial trigger. Had I noticed how bizarre at that moment, I might have focused more forensic attention to it. However, we had the grandsons with us and a lot more trail to explore. And now allow me to explain the parallel to life, living, and enterprise lessons. How often have we of a sudden realized we had stumbled into a predicament of life or business that we declared a real mess? A mess that we did not anticipate or see until is was solidly upon us? A broader observation relates to the full set of photos above and below. 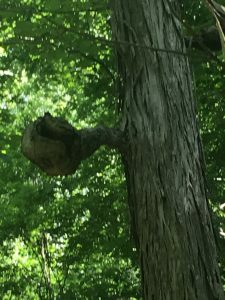 Everyone of these images of tree form oddities is explicable… attributable to some combination of agents, forces, and genetics. Isn’t it the same for our own life and living? Our individual oddities are due to some set of forces, conditions, and circumstance. I had previously misidentified (in at least one prior post) the smooth-barked vine below (right and left) as a muscadine (Vitis rotundifolia). A reader set me straight, correcting the i.d. to Alabama supplejack (Berchemia scandens), common across our state, found very often in bottomlands. Unlike poison ivy (Toxicodendron radicans), which holds tightly to climbing surfaces with hairy tendrils, supplejack grasps in spirals, clinging tightly with the strength of stem turgor pressure. I include these photos as novelties — the vine strikes me as a woody snake… a boa wrapping and reaching toward the sunlight above. A supplejack vine left its spiraling scar on this red maple along Beaverdam Boardwalk Trail (Wheeler NWR). A supplejack vine ascends beside the maple trunk. 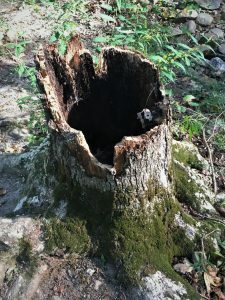 I’ve seen many a mountain craft walking stick (smaller than this six-inch diameter maple) with a pronounced spiral form. Sometimes looking down and horizontally misses the magic in front of our noses… well, maybe above our noses. 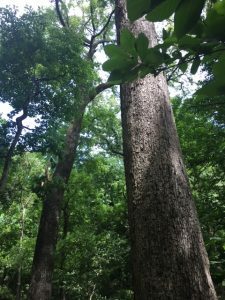 In this case, a vertical view from ground level in this bald cypress (Taxodium distichum) stand at Wheeler NWR. The formal term for this oddity (which is not all that uncommon) is crown shyness. 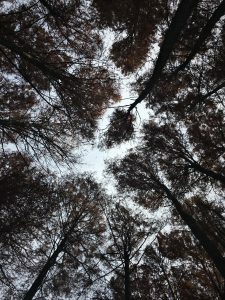 Yet, it is odd enough, that even nearly 46 years beyond a BS in forestry, I only recently stumbled across the phenomenon and actually learned the term. I will now be spending more time on my back in coming hikes, seeking crown shyness in other stand and species mixes. Perhaps I will be viewed, lying on my back with camera in-hand, as the in-woods oddity! 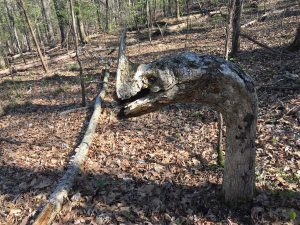 I found these two oddities on the trail this early fall at Cheaha State Park, leading from Cheaha Lake to the summit.Certainly odd, yet fully explainable. 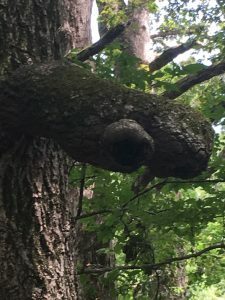 The Virginia pine (Pinus virginiana) and target canker, with its inner-wood skull-face with clay pipe in mouth, derive from a perennial fungal infection that is decades-old. The white oak (below left), hollowed by an internal fungal rot, had recently yielded to the force of wind (maybe a breeze) and gravity. Insects surely played a role in excavating the debris within. We humans all carry some form of scar, whether physical or emotional. My psychologist friends tell me that the explanations are often just as apparent. Not all woods oddities are attributable to biologic agents. The oak (lower left) grows along the loop road atop Cheaha. Some physical force bent the sapling-stage lateral branch just five feet above ground. The sunlight available at the road edge enabled the now stout branch (as large as the main stem) to thrive at nearly horizontal. The oak (lower right) likely suffered ice damage decades ago and assumed this flattened-top form. The old timber beast in me (nurtured by 12 years in the forest products industry) still appreciates a tall straight bole (clear wood) on a valuable timber species. Today, with no direct ties to commercial forestry, I’m drawn to the fancy, beauty, and mystery of these unusual forms. Some trees provide fodder for mythology and legend. 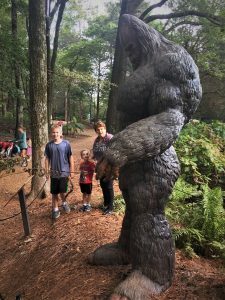 Lower left is Bigfoot, part of an early summer exhibit at the Huntsville Botanical Gardens (HBG). 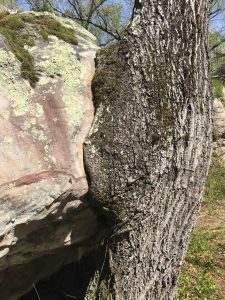 However, the image lower left is Nature’s very own hand at work on a white oak (Quercus alba) along a woods trail at Lake Guntersville State Park. I was sober… the camera was true… the form uncannily resembles the HBG Bigfoot in shape and scale. I struggle to offer much of an explanation. 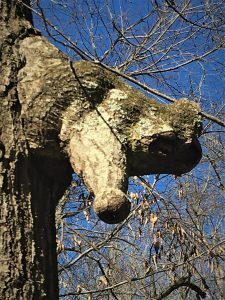 We’ve all seen tree burls. This form I believe derives from an arrangement of burl clusters. A bizarre and fanciful arrangement to be sure. Perhaps next time I walk the trail, the figure will have moved to another location?! I’ve seen Nature do some odd work with branch stubs. Another manifestation of burls, I suppose. 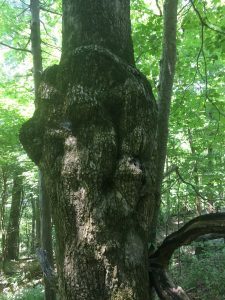 I was surprised to see “ET” peering from behind the shagbark hickory (Carya ovata; lower left) at Monte Sano State Park. I like the hickory (Carya sp.) “periscope” at Joe Wheeler State Park (lower right). December 22, 2018 we took the two Alabama grandsons to hike along Bradford Creek Greenway right here in Madison. 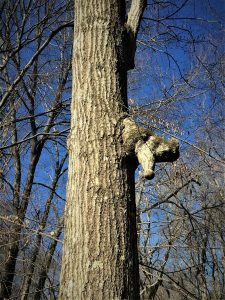 They dubbed this red oak (Quercus rubra) branch stub as the “thumbs-down” tree. Aptly named! 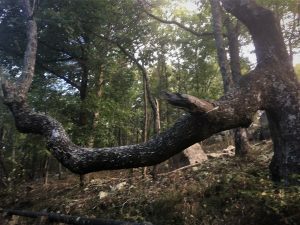 And here’s the dragon tree along a trail at a location I can’t recall. Its story? 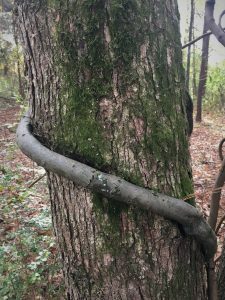 At sapling stage, a physical force (nearby tree or large-enough branch) bent it to 90 degrees. The sapling sent a vertical shoot to seek sunlight above. That vertical stem at some point much later (perhaps that’s it lying near the “mouth”) broke off, leaving the standing dragon with snout, mouth, and eye! Again, we are all shaped by forces external. We all react to situations, circumstances, and objects we encounter, both real and metaphorical. Perhaps this is the oak’s version of “kissing the Blarney Stone to gain the gift of eloquence. This kiss appears to have lasted decades. 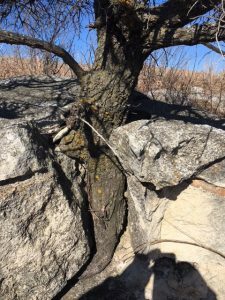 I found this prairie crabapple (Malus ioensis) growing contentedly is a fissure on a limestone outcrop on the Konza Prairie Biological Station near Manhattan, KS. Talk about making the most of the hand we’re dealt! I included this photo in my July 5, 2018 GBH Blog Post on Joe Wheeler State Park. 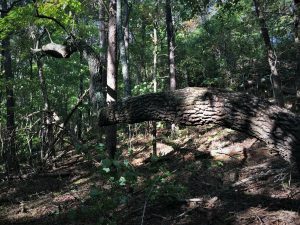 Here is the paragraph lifted from that Post: “This is the classic old growth white oak (Quercus alba) specimen along the trail. How can we not be inspired by the giants in our mixed hardwood forests. Yes, I’ve seen Yosemite’s Sequoia, coastal Redwoods, and Pacific rain-forest Douglas fir. Certainly special to visit, yet I remain transfixed by our eastern forests in their mixed-stand splendor, made all the more special by their proximity (no west coast flights required!) and the reality that most are second-growth forests.” This is anything but a tree form oddity. 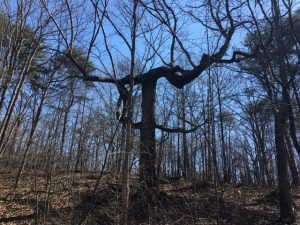 This tree demonstrates what happens when a tree with good genes (genotype) finds itself on a high quality site with plenty of time (well over 100 years) in the absence of imposed environmental trauma (wind, ice, lightning, etc.). The result is a near-perfect phenotype. 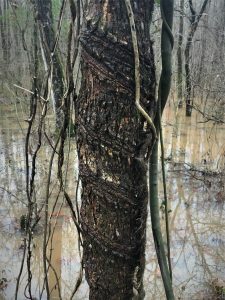 I’ll draw this Post to a close with the odd hackberry knot/burl contorted branch/stem composite that I used in my opening. And I will continue my quest to re-discover this odd clustering at Wheeler National Wildlife Refuge. I shall not be thwarted nor denied! 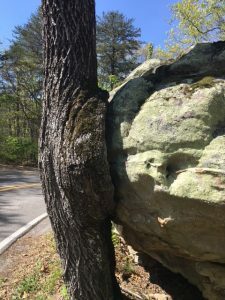 Like trees, we humans (and our enterprises) are shaped by forces, circumstances, and pressures. We humans all carry some form of force-induced scar, whether physical or emotional. Trees adapt remarkably well to adversity — they seem to play well with the hand they’re dealt. 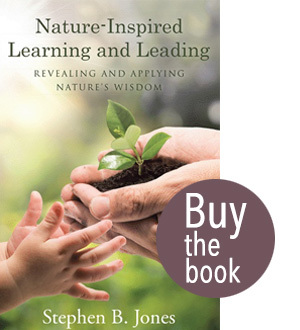 Learn more — understanding deepens and expands appreciation, adaptation, and wonderment. May Nature Inspire and Reward you… both in her perfection and her foibles, scars, and oddities!